Can you interpret the Bible for yourself? 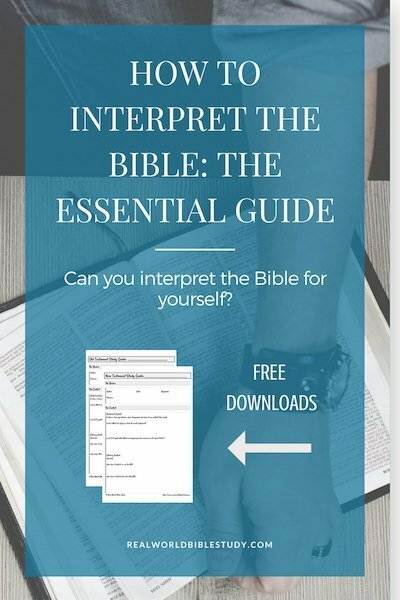 Can you just open the Bible and understand what it means, or do you need someone to interpret the Bible for you? What do you think? Disclosures: This page contains affiliate links – they sure help to pay off those student loans! For more information, please see my disclosure page. The truth is that both answers to this question are a little bit right. On the one hand, Scripture is for everyone. The Holy Spirit speaks to us while we read it to help us understand, and there are some things in Scripture that are easy to interpret. For example, “Children, obey your parents because you belong to the Lord, for this is the right thing to do” (Ephesians 6:1 NLT) is pretty straightforward. A third grader can understand that, even though she doesn’t want to hear it! On the other hand, we need a little help. Let’s face it: most of us don’t speak ancient Greek! (Or Hebrew!) We also probably don’t know some things about what was going on 2000 years ago. And sometimes, we think that thought came from God when it was really just a brain fart. So we are going to need some help to interpret the Bible. But that doesn’t mean that we need someone to do all of the interpretation for us, or that only pastors or seminary theologians can interpret the Bible. We just need some help with the heavy lifting. The big deal is that we interpret the Bible with the help of the Holy Spirit and as part of a community. The Holy Spirit “illumines” (lights up) Scripture to help us understand, and we study with a community so that we can catch each other’s bloopers. That community includes the people with us today, some of whom have been trained in this stuff, and the people from our historical community, all the believers who have gone before us. We really get to stand on the shoulders of giants here. When you discuss your Bible study with your small group, your spouse, or your friend, you are studying as part of community. But also, when you use a study guide, a Bible translation, or a commentary, you are studying as part of a community. The good news is that with the Holy Spirit and some great tools, anyone CAN interpret the Bible. 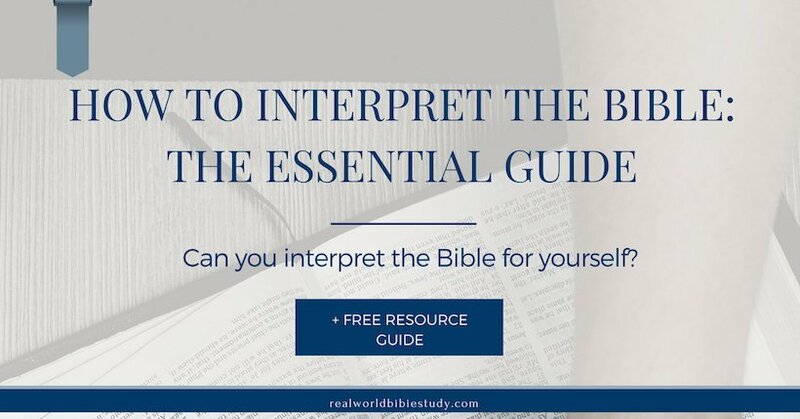 FYI, this post relies heavily on one of my all-time favorite Bible Study resources, a book called How to Read the Bible for All Its Worth by Stuart and Fee. This book is a go-to reference for me, and I’ve been using it for so long that it is ingrained in my teaching on this subject. Go get your Bible, hold it in your hands. What language is it in? When I teach this lesson in New Testament classes, I hand students a Bible opened up to a passage and ask them to tell me what it means. Exegesis: What was the original, intended meaning? Step 1: What did it mean back then when it was written? 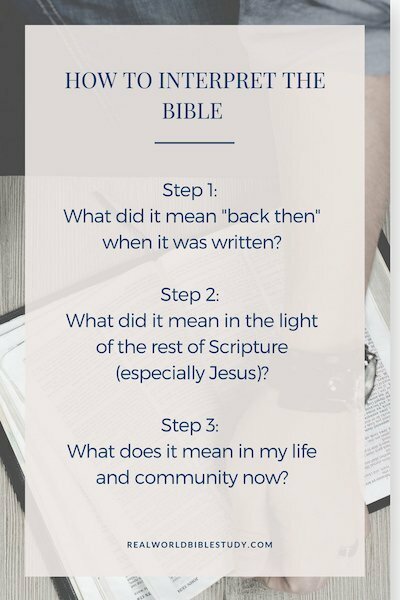 Step 2: What did it mean in the light of the rest of Scripture (especially Jesus)? Step 3: What does it mean in my life and community now? This is really important, because it “cannot mean what it never meant.” The true meaning of the biblical text for us is what God originally intended it to mean when it was first spoken. So how do we figure out what it originally meant? We need to look first at the context. Historical context is important because there is a serious generation gap between Bible times and our time, and even between one part of the Bible and another. Have you ever heard a much older person say something that didn’t quite make sense to you? Imagine that age gap multiplied by thousands of years. When the apostles were all in one accord, they weren’t trying to squeeze everyone into a Honda! What was going on when the events in Scripture actually happened? What was going on when someone wrote about it? Was there a time gap? Why were they writing about it then? 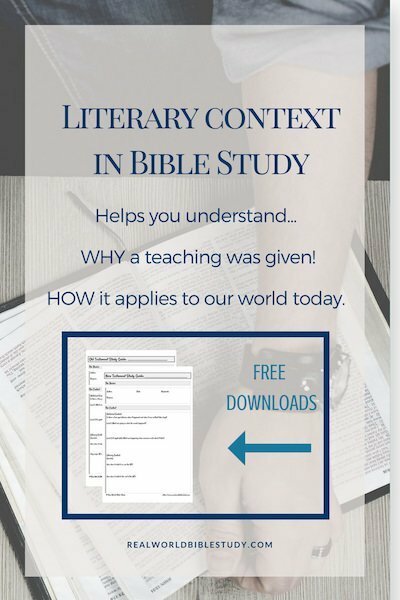 Literary context is about the type of writing you are looking at (genre), and where it sits within a particular book in the Bible, what is happening before and after. When someone reads a poetic line and interprets it in a non-poetic way, they are missing out on literary context. The same is true if someone reads a single verse and doesn’t take into account what is written before and after. You might not get the significance, or you could get the meaning totally wrong, like I discuss in my post on How to Misinterpret Old Testament Stories! Should you necessarily do what that passage says? Of course not. God told Hosea to do that, for a very specific reason which you’ll get if you read the rest of the book. If you read that part of the verse on its own, out of context, and take it as a command for your life…well, you could have an interesting marriage, at least. You get the idea. You want to know where the passage fits in with the stuff around it (and what that stuff is). What type of writing is it? Who is the writer writing to? What’s the situation when it is being written? This isn’t just for passages that start out confusing to you, by the way. This exegesis step – what did it mean when it was first written? – should be the first step to interpreting the Bible ALWAYS. You’ll have to train yourself to think this way, and the good news is there are some great tools to help you do the heavy lifting. The easiest tools for most people to use would be a Study Bible and a study guide. Those are some tools you should definitely have for your personal Bible study. 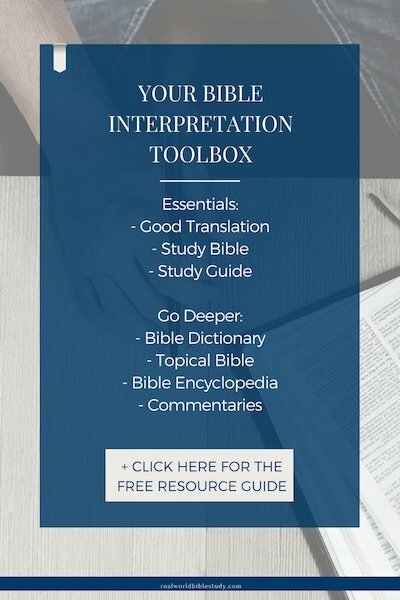 If you want to go deeper, you can find commentaries, Bible dictionaries, and other reference books at the library or borrow them from a pastor or teacher. (Note: I’ve found that public libraries often don’t have a great selection when it comes to Bible study resources. If your pastor doesn’t have something you can borrow, check out the local seminary or Bible college library, or even a public college library.). Wondering which tools to use? No worries, I’ve got you! 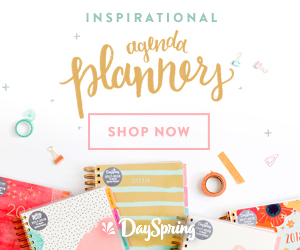 Click here to access my list of the best Bible Study resources, including resources for everyone from beginners to pastors and seminary students. This one comes up especially with Old Testament (OT) passages; their old meaning is still good, but we have a deeper understanding because of the New Testament (NT) and Jesus. Remember, we can (and should) use Scripture to interpret Scripture. This is really important when you are trying to figure out whether you should follow Old Testament laws, because some of them are specifically cancelled out in the New Testament! Rome by Paul (Romans 16:1,2). We can see that Paul writes some things that suggest women shouldn’t be in leadership. In other places, though, he writes in a positive way about women in leadership. Women in leadership are described in a positive light throughout Scripture. We use the rest of Scripture to understand what the first two passages really mean, and who they are for. Knowing literary context, we can understand which instructions are for all people everywhere and which are for a particular audience. We can interpret the Bible more accurately when we know why those teachings were given and which present situations they might apply to. 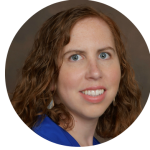 If you want to go deeper on the women in leadership concept, you might want to check out this great position paper on the role of women in ministry. This is where we start asking questions like, how am I like the people in the story? How am I different? What situation might this be like in my world? The “bridge” is the connection between real life back then and real life now. I’ll let you in on a little secret. It is way easier to find the bridge when you understand the original audience and what they were going through. And this is not just going to protect you from bad interpretations. It will allow the Holy Spirit to speak to you and shed light on your life in a deeper way than ever before. You can interpret the Bible. This is (hopefully) what your pastor is doing when he or she prepares a sermon. But it isn’t something you have to wait until Sunday morning to experience. You (yes, you!) can interpret the Bible correctly every day, at home and in conversation with the community around you. You can have those ah-ha moments every day even if you don’t have a pastor explaining it. It’s so important for you to be able to do this yourself. That’s part of what the writer of Hebrews is talking about when comparing baby food to solid food (Hebrews 5:12-14). Eventually we need to move past the pre-chewed stuff and start eating grown-up food. Finally, don’t keep it to yourself! When you know how to interpret the Bible yourself, you can share God’s Word with others in ways that will make sense to them. Real, life-giving words. That’s pretty awesome stuff, right? Gordon D. Fee and Douglas K. Stuart, How to Read the Bible for All Its Worth, Fourth edition. (Grand Rapids, Michigan: Zondervan, 2014), 30.